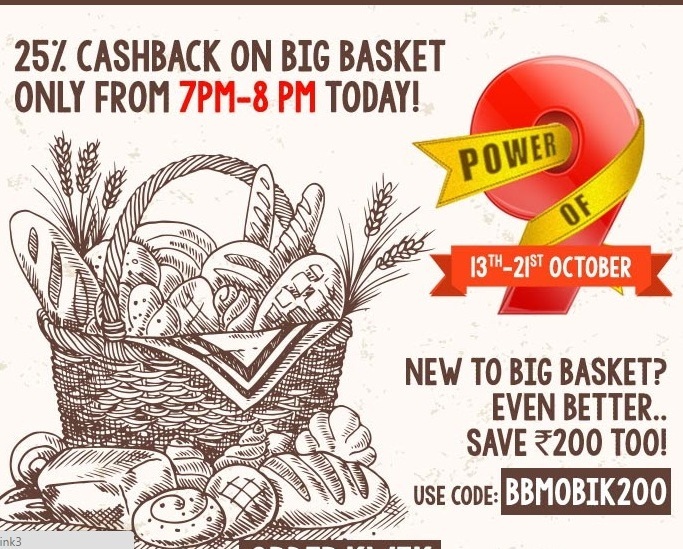 Offer Name - Mobikwik Power of 9 Offer: Get 25% cashback up to Rs.100 on Big Basket. If you are a new user for BigBasket.com, you get additional Rs.200 discount. How to avail this BigBasket offer? 1. Visit Bigbasket.com. You have to place your order between 7-8 PM today. 2. If you are a new user for Big Basket, apply BigBasket coupon code 'BBMOBIK200' to get Rs.200 discount on purchase worth Rs.1000 or more. 3. Pay with Mobikwik to get flat 25% cashback up to Rs.100. 1. Offer is valid only from 7- 8 PM today(15 October 2015) only. 2. New users of Big Basket get an exclusive MobiKwik discount of Rs.200 on using the Promo code 'BBMOBIK200'. Minimum purchase value is Rs.1000. Mobikwik BigBasket coupon code has to be used on Big Basket at the time of checkout. 3. Cashback is valid only once per user per merchant. 4. The Kwikest user who avails all the 9 deals will get a chance to win a G-shock watch worth ₹10,000. 5. Recharge Hour: Flat Rs.100 cashback on bill payments and recharges for first 100 users. Minimum recharge/ bill payment amount is Rs.100. Offer is valid on transactions made from 7 - 8 PM pm only.| Offer is valid from 13 October 2015 to 21 October 2015. Cashback will be credited with in 24 hours.